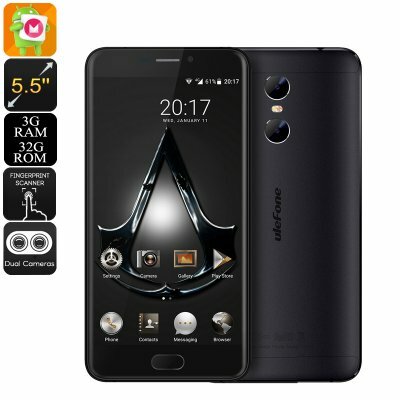 Successfully Added HK Warehouse Ulefone Gemini Android Phone - Quad-Core CPU, 3GB RAM, Android 6.0, 13MP Dual Cam, 1080p Display (Black) to your Shopping Cart. Meet the Ulefone Gemini, an affordable Android phone that comes packed with an abundance of great features to separate it from its competition. Running on an Android 6.0 operating system, this Chinese smartphone is guaranteed to deliver a smooth yet powerful user experience. Coming with the latest features the mobile industry has to offer, you certainly will be able to take the most out of this beautiful device. With its two IMEI numbers and 4G connectivity, this latest Android phone will make sure that you’re always within reach for friends and family, no matter where on the globe your next adventure will take you. Perfect for anybody out there that is looking for a phone with great specs and a low price tag – this Ulefone Gemini is sure to meet all your smartphone demands. With its beautiful 5.5-Inch Full-HD display, this latest Android phone allows you to enjoy all your favorite media, games, and more in stunning 1080p resolution. By displaying great detail and vivid color, this phone is guaranteed to lift your mobile entertainment experience. Its display furthermore features Corning Gorilla Glass 3, making it resistant to scratches and regular bumps and drops. With this tough smartphone you’ll be able to enjoy media wherever you are and, thanks to its epic 3250mAh battery that provides up to 12 hours of continuous usage time, you’ll be able to get through the most demanding of days without fearing about battery life. Packing a powerful Quad-Core CPU as well as 3GB of RAM, this Android smartphone is capable of handling mobile games, movies, and applications at ease. It holds 32GB of internal memory and provides you with the option to slide in a 256GB SD-card, ensuring that there will always be enough space to store your favorite games, media, and files alike. Simply head out to the Play Store and download one of the million free to download applications – with this phone at your side you’ll never have to feel bored again. Thanks to its breathtaking 13MP dual rear camera, this Android phone truly takes smartphone photography to the next level. Allowing you to shoot crisp images in great detail as well as Full-HD video, the Ulefone Gemini makes sure that not a single special moment in life will ever pass by uncaptured again. Additionally, it has also been equipped with a sophisticated 5MP front snapper, making it perfect for all selfie lovers out there.